Our current President Anne Smith has been actively involved with our local Women’s Refuge which provides accommodation for women and their children. She was hoping to raise £500 from family friends and associates to provide better amenities for the women other than managing on benefits. 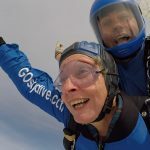 Dropping over Old Sarum from 10,000 feet and free falling for 40 seconds was an exhilarating experience, then floated down to earth after manoeuvring the canopy and enjoying the view. This endeavour resulted in raising over £1,200 thanks to all Rotarians for their support.